If you’re worried that your teenager has been gaining weight lately, and if you think television, video games, and internet use may be playing a role, you’re not alone. According to a study conducted by the Kaiser Family Foundation, kids between the ages of 8 and 18 now consume an average of seven hours and 38 minutes of media per day. If you’re doing the math, this adds up to around 53 hours — or more than two days — per week. In this light, it’s no surprise that teen obesity is on the rise. According to the Centers for Disease Control and Prevention, 20.6% of all American kids between the ages of 12 and 19 were obese in 2018, with many more being overweight. This represents a startling threefold increase over the previous 25 years. Multitasking: With media multitasking, teens actually consume nearly 11 hours of raw media content packed into those seven hours and 38 minutes. This comes from, for example, watching TV and using the internet at the same time. 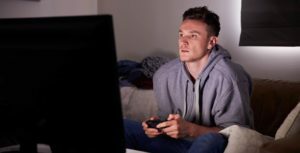 Parental limitations: Only three out of 10 young people have parent-enforced limitations on daily TV, video game and internet use. Kids who have media rules consume far fewer media per day – fewer than three hours, on average. Media at home: Nearly two-thirds of the kids surveyed said that the TV is typically on during meals. Around half said that the TV is on “most of the time” at home. Seven out of 10 kids have televisions in their bedrooms, and half have video game consoles in their rooms. Kids with a combination of these factors consume on average far more than peers who do not. Ethnicity: Hispanic and black children consume about two more hours of media than white children. School: As a general trend, the more media kids consume, the lower their grades. About half of the kids surveyed say they watch TV while doing their homework. Reading: On average, kids spend less than 30 minutes per day reading books, including school-related books. How Much Exercise Do Teens Need? All this media use greatly cuts into the time that kids spend exercising, which partially explains why over three times as many kids are obese now compared to 30 years ago. Adding to this problem is the unfortunate fact that many physical education programs across the country have been cut. In fact, several studies over the past few years have found that a large percentage of teenagers barely get any exercise at all. Between school, media consumption and homework, exercise simply doesn’t get a spot in the daily routine. But, in order to be healthy, it’s very important for kids to exercise most days, if not every day. According to U.S. government recommendations, everyone, including teenagers, needs at least 30 minutes of moderate physical activity every day. However, this is just a minimum, and 60 to 90 minutes a day is preferable, especially for individuals who are trying to lose weight. Even in top-notch physical education programs, kids rarely get this much, which is why it’s so important for parents to do what they can to encourage children of all ages to get outside and be active. All of that being said, there are other factors besides weight to take into consideration. After all, teenagers usually have fairly robust metabolisms, and it tends to take a lot for them to become obese. It’s not unheard of for a young person to barely exercise and eat heartily without being overweight. Even when a child is not overweight, lack of exercise and excessive media consumption can be unhealthy. For one thing, the inactive child misses out on all the health benefits of regular exercise. Exercise helps kids sleep better, which makes it easier for them to concentrate on school and homework. It also gives them energy, elevates their mood and gets them into patterns of health that will be essential during adulthood. It’s also been found that excessive media consumption can lead to mental health issues in children. It can interfere with their ability to concentrate on tasks even when no media is on, and it can correlate with depression, anxiety, and social problems. Outdoor activity: Every minute that your child spends outside is a minute away from unhealthy media consumption. Encourage your child to play sports, have outdoor hobbies, and enjoy the neighborhood and local parks. Focused study time: For your child’s health and school performance, it’s important to set a time during which he or she will focus on nothing but homework. Books: Reading is a wholesome and healthy alternative to media consumption. And unlike television and the internet, books actually enhance a child’s concentration and cognitive abilities. Quality family time: To help break the media habit, turn the television off during dinner times, and place a high value on having a quiet, non-media-dependent household.